Today marked my first day off from working since I returned to the farm. As such, today has been more relaxed. I’ve been puttering around the farm, having a decadent and leisurely breakfast of french toast and bacon, doing some relaxed reading, a bit of cleaning, preparing dough to bake bread later this evening, and noticing old fermentation projects. This last came about due to Ginger mentioning the possibility of a dinner using sauerkraut. I went exploring what we had on hand, knowing I made some this summer and that I even had a couple quart jars of the stuff from a year and a half ago floating around. The sauerkraut from this summer sat in a crock out on the porch and, upon the last check, it had been covered by quite a bit of nasty looking mold. It might be able to be saved, but I didn’t feel excited about trying. So next, I checked the oft-ignored cold box in the house and scrounged up a quart jar about two thirds full, made in the summer of 2010 when I was farming at Sauvie Island Organics. That, too, had molded on the top—though perhaps not to the same degree as the crock sauerkraut. Voicing my distaste for that jar, Ginger noted from upstairs that I had a few other random fermentation projects I should check, sitting on the kitchen shelves in mason jars. One was a batch of ginger carrots and the other a jar of cherry chutney. I hadn’t forgotten totally about the carrots—I consistently would catch glimpses of their orange presence while in the kitchen—but the cherry chutney had long exited my memory. Curious now, I pulled down the ginger carrots and took a taste. The fermentation process on these had clearly gone into overdrive. Most of the liquid had dried out and while the carrots hadn’t turned moldy (perhaps due to the ginger) they had turned to the consistency of mush. They also had an incredible bite to them, not so much from the ginger as the long fermentation and high build up of lactic acid. They weren’t particularly pleasant, but I imagine they could give quite a boost to the digestive system. Perhaps they could be turned into a tonic. The cherry chutney also packed a punch, but it had better survived the long months of quiet shelf life. This had been my first attempt at chutney and came from a recipe in Nourishing Traditions, dusted off after Ginger acquired multiple large boxes of cherries from a fellow market vendor on the cheap. After spending an hour or two pitting the cherries alongside some WWOOFers, I decided to finally try out a chutney recipe—something I’d been wanting to do for years but had never gotten around to. Lo and behold, the recipe turned out great. A mix of cherries, cloves, coriander seeds, and the zest and juice of an orange, the chutney ended up sweet and spicy, with a bite from the lactic acid. In the months that followed, the chutney sat on the shelf, somewhat forgotten as, while I loved it, I wasn’t entirely sure what to use it on or with. Tasting the chutney now, I found that it had preserved wonderfully, not molding a bit and essentially becoming tangier. The lactic acid had increased, but otherwise it was the same lovely chutney. So now I have to figure out some way to eat it. Perhaps just a spoonful or two with the occasional meal for digestive purposes and to add a little something interesting. Finally, having explored these random jars of fermented foods, I remembered my forgotten bottles of ginger ale out in the tool shed. 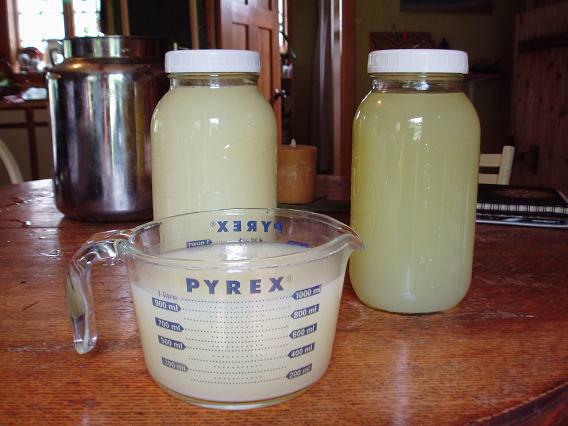 I started making ginger ale this year and it proved a success—with certain caveats. The bottle conditioning proved a bit overzealous, creating a drink carbonated to the point that it would either explode out of the bottle upon opening it (though I developed quite the skill for popping the cap outside while holding a large glass and being able to immediately direct the fountain into said glass, preserving most of the soda) or sometimes just shatter the bottle. This happened with one batch sitting on the same kitchen shelf that the chutney now sits on. I was standing next to the bottles when one of them exploded, sending out small shards of glass and sticky soda. Somehow, none of the glass hit me. Needless to say, I moved the soda to a less exposed place, which in this instance meant a box tucked away in the tool shed. Of course, I promptly forgot about the soda. It was made on July 19th—much of it is still out in that box in the tool shed. I noticed it about a month ago, much to my surprise and chagrin, and so today I figured I should give one of those bottles a try since I was in that mode of past project exploration. The reused beer bottle was dirty, the cap a bit rusty, but it otherwise seemed okay. I pulled my trick of popping the top outside with a glass handy and pretty soon had a nice mug of fizzy ginger ale, no worse the wear for being nearly six months old. In fact, it was delicious and I drink it now as I write this post. So by my final count, that’s three less-than-successful projects (though all of them had their day) and two that had survived the months of neglect to still provide tasty, fermented goodness. Not a bad haul for such a lack of attendance! And a good reminder of one of the joys of fermentation projects: they’re alive and changing and so you never quite know what you’ll end up with as you let them play out their existence. While the moldy sauerkrauts don’t shock me, I didn’t expect the ginger carrots would fail to mold but turn to mush as their brine dried out or that the cherry chutney would remain mold free and as delicious and edible after multiple months on the shelf as shortly after I made it. It’s a pleasant surprise to return to old projects and find their success continuing, and a nice reminder from the less successful ones that a bit of care and attention can make the difference between maintaining something useful or losing its function. For 2012, then, I resolve (amongst many other resolutions) to provide more care to my fermentation projects and to be more attentive to my food preservation attempts. As for my other 2012 resolutions relevant to this blog, that promised post is still coming. It should be up later today, in fact, or Sunday evening at the latest. And for those who have done their own fermentation experiments, feel free to share your successes and failures in the comments. 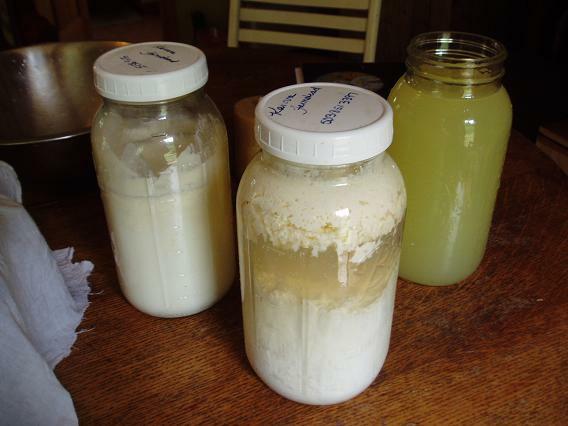 I love a good bit of fermentation, and am always interested in hearing what others have done. My full whey station set up, spread out on the kitchen table. The glass in front has beer in it. Not sure how that snuck into the picture. My earliest homesteading activities involved food. I think this is common and appropriate; food is basic and elemental, inspiring and accessible. It makes sense within our culture to homestead via food because food is still so capable of connecting us with the earth on a basic level. Despite the incredible success of the industrial system to take over and pervert food within our society, we still respond to it on a very basic and emotional level. Food triggers memories within us, connects us to friends and families, and reminds us of what it is to be human. Many of us still garden, even if we also eat industrial, processed foods. And many of us still preserve food–sometimes from the bounty of our own gardens and sometimes with produce from the store. Either way, that’s a very basic connection and one that many of us still maintain. The reason my early homesteading involved food is because one of the main books that inspired my interest in homesteading was Nourishing Traditions by Sally Fallon–and Nourishing Traditions is a book about food, through and through. It’s an alternative cookbook aligned with the Weston A. Price philosophy of eating and rails mightily against not only the industrial food system, but a good deal of mainstream health and diet beliefs. It deals in traditional foods and contains quite a bit of information and many recipes involving the fermentation of foods, demonstrating various ways of lacto-fermenting vegetables and fruits, championing homemade condiments and sauces that are lacto-fermented, and recommending using lacto-fermentation as a way to help break down grains before eating them. Nourishing Traditions (and another book, Real Food by Nina Planck) altered much of my thinking about food. One of the manifestations of that new thinking was to start drinking raw milk and, in general, eat more raw dairy products. I tracked down a source of it (not the easiest thing in Oregon, as there are strict laws governing how you can legally obtain raw milk, requiring that you purchase it directly on the farm) and before long I decided to engage in what I consider my first real homesteading activity: obtaining whey from raw milk. Whey is essentially the liquid aspect of milk. It’s what’s left over when milk is curdled and strained, separating out the proteins from the liquid. When obtained from raw milk, cultured milk, or yogurt, whey contains active cultures and bacteria–it’s a living substance. It is, in fact, an incredible healthy and robust living substance and, as such, it’s the perfect additive to various foods to kickstart the lacto-fermentation process. In lacto-fermentation, these bacteria basically start eating whatever food is immersed in them and then excreting lactic acid as a waste product. That lactic acid, in turn, builds up and ultimately preserves the aforementioned food by creating a brine that is too acidic for putrefying bacteria to live in. In other words, this is how you naturally pickle vegetables. Rather than putting them in a vinegar solution and then boiling them to kill off any bacteria, you use lactic acid-producing bacteria to create a living environment that is inhospitable to putrefying bacteria, thus keeping the food from spoiling as long as it stays in that environment. The benefit of this process is that the food is significantly healthier for you. It’s easier to digest and laden with living cultures that will assist your digestive system. The front jar is milk after it's separated and the back right jar is full of strained whey. All that being said, today I found myself with somewhere around three gallons of soured raw milk sitting out on the counter. This milk came about a few different ways. Some of it was from a large pail of milk I had inadvertently acquired just before taking a week long trip to Portland and it had soured before I returned home. Some was from a cheese-making experiment that did not quite work out. And some I just didn’t drink before it soured because I hadn’t been in the habit of drinking milk. (I had a couple months there when I wasn’t receiving it.) The beauty of raw milk, though, is that because it’s a living food filled with active bacteria and cultures, it doesn’t actually go bad when it sours. It just changes. It doesn’t taste as good, but it’s perfectly drinkable–if anything, it’s healthier for you. But since I don’t particularly like to drink sour milk, I decided to extract the whey from it instead, with the intention of embarking on future fermentation projects. The whey being strained through the towel and into the pot. The towel catches most of the milk solids and allows the liquid whey to pass through. 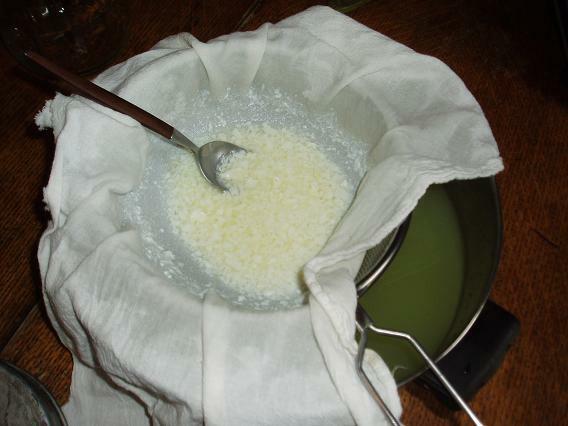 The separated milk after being dumped into the strainer lined here with a towel (or you can use cheese cloth.) Not the prettiest, admittedly. Next, you want to set a wire mesh strainer over a large bowl, then line the strainer with a couple layers of good cheese cloth or a towel. I used cheese cloth the first time I separated whey, but I found it allowed more of the milk protein through than I preferred. I later switched to a thin, organic cotton flour bag towel that drains slower, but otherwise works great. 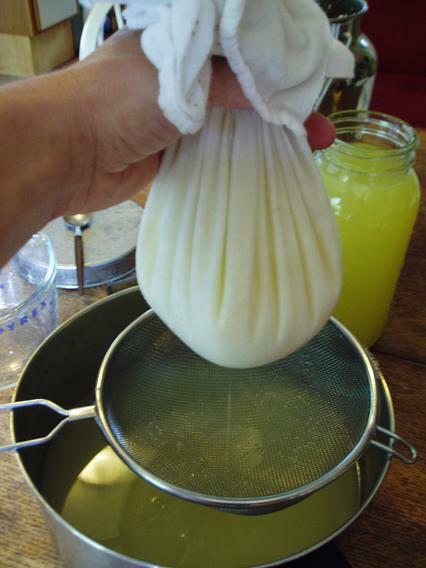 Once you have your strainer and towel set up, you can dump your jar of curdled milk into the strainer. 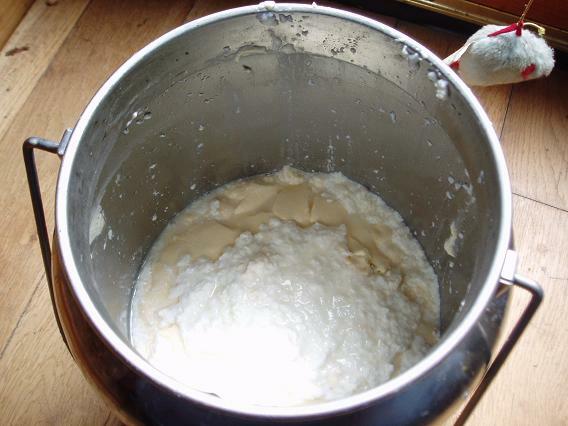 You should have an initial rush of whey that drains through into the bowl and then you’ll be left with the more solid mass, from which whey will drain for a couple hours if you let it. I typically let it drain for awhile and then later tie the towel’s corners to a wooden spoon so that it forms a small bag hanging from the spoon. You can then hang this over your bowl and let more of the whey drip out for however long you’re willing to wait. Here I am holding up the cloth bag of separated milk. You can see the whey streaming out into the pot. Now you’re almost done. Once all or most of the whey has dripped from the bag, you can simply pour the whey into a mason jar and store it in the fridge. The whey should keep for many months, ready to provide an assist any time you need to lacto-ferment something or soak some grains. Or you can just drink the stuff–it’s extremely healthy for you and will give a great boost to your digestive system. 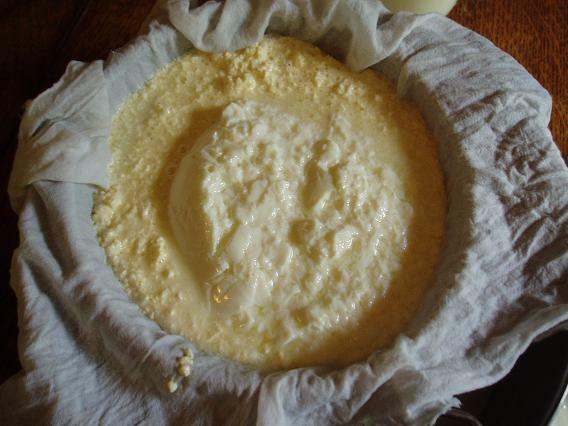 As for the leftover curdled milk proteins in your little cloth sack, that’s basically fantastic cream cheese! It’s a little different than what you would buy in the store. It has a sharper taste and isn’t as smooth of a consistency, but I’ve spread it on a bagel and found it to be fantastic. It also is far healthier for you and, like whey, is full of good cultures and bacteria that will give your digestive system a nice charge. The leftover milk solids (protein and fat.) This is nutritious stuff, but I don't have the desire to deal with it today. So out it goes into the woods, where a whole host of other creatures will enjoy and partake in its nutritious bounty. Unfortunately, my various milk products that I separated the whey out of today were all pretty well-aged. As such, the milk proteins were funkier than I prefer and I knew that if I kept them and threw them in the fridge, I would never get around to eating them. So I decided to dump it all, which I at first felt guilty about. It seemed like such a waste of some very nutritious food. But, of course, there’s no need to waste that food even if I don’t eat it. I took it out into the woods on our property and found a secluded spot to dump it. While I won’t be eating this good food, it will feed literally millions–if not billions–of other creatures. Tons of microbials will munch on it over the next few days, a variety of bugs and insects will surely get into it, and I imagine a few little critters will have their share, as well. There’s plenty of life on this land–the food won’t go to waste. After dumping the milk solids, I still had myself quite a bounty: over a gallon of whey. Luckily, it’s the height of summer and there’s plenty of food around that can be fermented. Over the next weeks and months, I plan to make pickles and sauerkraut, to ferment squash, make kimchi and chutneys, to lacto-ferment roasted red peppers (I did this last year and they were amazing), make live culture homemade condiments, probably soak some grains, and more. This is part of the beauty and excitement about extracting whey from raw milk: it’s a prelude to still other projects. It’s a laying of the foundation. It seems, then, appropriate that it was my first real homesteading project. It led me to further projects and set me on a fermenting path I’m still on today. 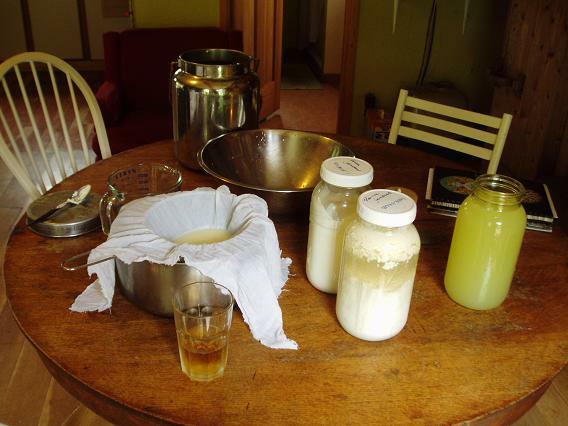 The project's results: over a gallon of fresh whey from raw milk, ready for use in various fermenting projects.